The religious "beliefs and rituals" known as "Saivam" or "Saiva Samayam" in Tamil, and as "Saivaism" or "Saiva religion" to the rest of the World, is the main branch of the Hindu Religion of today. It acclaims the worship of the "God Supreme" - "the one who has not even a name or a form" - as enlightened by the Tamil Saiva Saint Maanikkavaasakar of Tamil Nadu as "Oru naamam oar uruvam, ontrum illaarkku" in his religious text Thiruvaasakam (in Tamil). The origin of the worship of "God Supreme" as "God Siva" is still not clear, but in all probability the religion Saivaism professing the worship of "God Siva", originated among a very early civilisation(unknown to us) in the Tibetian region adjacent to the present northern - Nepal and Uttar Pradesh of India. This early civilisation of this region in all probability conceived the original form of "God Siva" as a human masculine, having - a lock of hair (kontrai) on his head bearing the crest moon and the river Gangai flowing from it, a third eye in his forehead and a blue mark around his neck, holding a trident in one hand and dressed in tiger skins with cobra snakes around his neck and arms, with "Goddess Sakthi" - deemed as his inherent energy - on his left side as a human feminine, and both having the bull as their vehicle, and with the snow capped Mount Kailash of the Himalayan mountain range as their abode. The point of the earliest era from whence the worship of "God Supreme" in the form of "Siva" took shape, among the civilisation in the vicinity of Mount Kailash in the Tibetian region, could be taken as the time of inception of the Saiva religion. 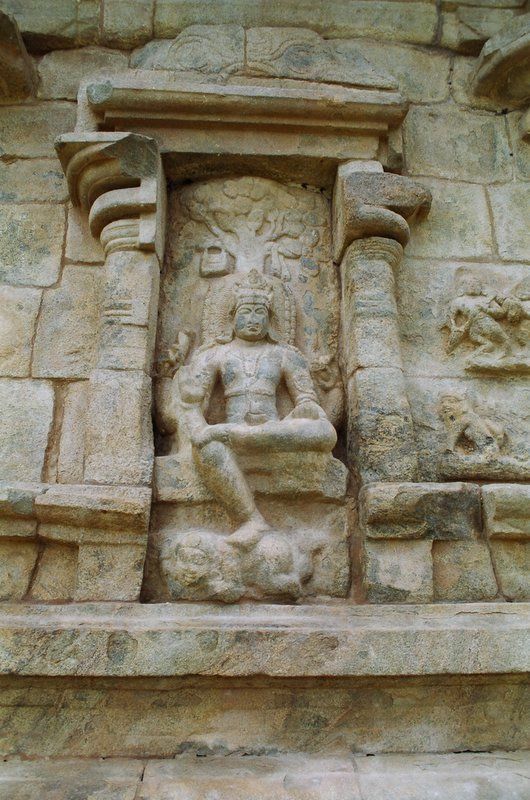 The Saivaism over a period of time gradually spread all over India, including the regions in its north-west among the Indus Valley civilisations, and in the remote south upto Tamil Nadu and Sri Lanka, where the sage Agastiya and king Ravana respectively became the ardent devotees of God Siva. Thus the original Saiva religious concept of God, and the related forms of worship that reached various parts of India from the Tibetian region, continued to be practised in their original forms "being a common religion (Saivaism) to both Aryans and Dravidians of then India". This was the reason why the Tamil Saiva Saint Thirunaavukkarasar of Tamil Nadu has mentioned in his religious text the "Thevaaram" in the sixth Thirumurai (in Tamil) as ".....Ariyan kandaai, Thamilan kandaai....."
Over a period of time in some regions of India the original Saivaism underwent further developments evolved by the Sages and Saints of those regions, independently with their own "new" - God forms of "Siva" and "Sakthi", religious philosophies, modes of worship, and religious texts - greatly influenced by the language, culture and traditions of those regions, and integrated with the practices of the original Saivaism. During the early period of Tamil Nadu too, the original form of Saivaism with the "God Supreme" represented in the form of "Siva & Sakthi", and the forms of their worship as evolved in the Tibetian region were well known. With the passage of time the original Saivaism gradually underwent further developments in Tamil Nadu - with the evolution of new religious concepts on the special attributes and glories of "God Siva" & "Goddess Sakthi", and their new forms of representation in relation to these special attributes and glories too came forth from Tamil Nadu - as Lingothpavamoorthy (God Siva represented in the form of Lingam), Thetchanamoorththy, Arthanaadeeswaramoorthy, Kalyanasunderamoorthy, Uma-Maheswaramoorthy, Somaskandamoorthy, and as Nadarajamoorthy. Likewise "new"- holy religious texts, modes of worship, and religious practices - too took shape independently, influenced by and blended with the culture and traditions of Tamil Nadu that existed during this early period. 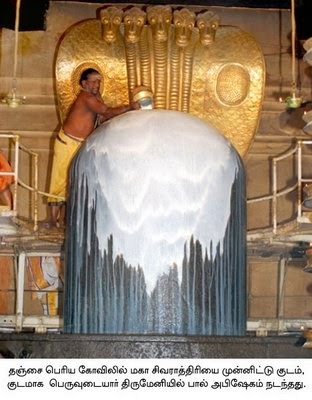 New concepts of God Siva being represented in five element forms of the universe too developed in Tamil Nadu as fire, water, air, earth, and space, and was represented in his symbolic forms as Panchalingams (five Lingams) with each Lingam representing an element. Further concepts that these five elements were associated with five important Siva-Temple Shrines of Tamil Nadu too developed, and were known as Panchabootha Thalams (shrines). These Temple Shrines were Thiruvannaamalai, Thiruvaanaikkaa, Thirukkaalaththi, Kanchipuram, and Chithambaram respectively. Also new concepts of God Siva's eight deeds with mythological stories relating to them too developed in Tamil Nadu, and these deeds were associated with further eight Siva-Temple shrines of Tamil Nadu, and were known as Atta Viratta Thalams. These Temple Shrines were namely, Thirukkandiyoor, Thirukkovilur, Thiruvathikai, Thiruppariyaloor, Thiruvirtkudi, Thiruvaluvoor, Thirukkurukkai, and Thirukkadavur. Thus the Saivam or Saivaism which developed in Tamil Nadu is called "Thamil Saivaism" (or Tamil Saivam), as much as the Saivam that developed in Kashmir is known as "Kashmira Saivaism" and that developed in Karnataka as "Vira Saivaism". However in Tamil Nadu of South India he was ‘mainly’ represented as Aadavallaan (Nadarajar), Thenmuhak Kadavul (Thetchanamoorthy), Pennoru Paahaththaan (Arthanaariswarer), Kalyaanasundaramoorthy, Uma Maheswaramoorthy and Somaskandamoorthy, Lingothbavamoorthy among many others based on his various aspects. 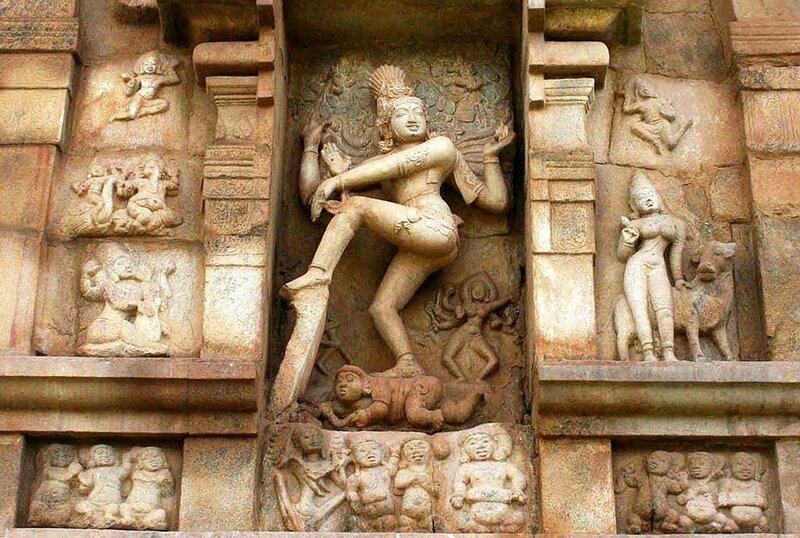 All these forms of “God Siva” evolved in Tamil Nadu, as part of the development of the original Saivaism of Nepal in South India. The Aadavallaan (Nadarajar) Image of God Siva (God as Siva) thus evolved signifies the evolution of the Earth and the creation of all its Living Beings to the reverberations set in by the Holy Syllable "Om" - the Omkaara Manthiram, from which emanted his Dance to the rythem of the Udukkei (Drum) held by him. This concept is portrayed in the Tamil Dance Treatise the "Kootha Nool of the third Sangam Period as follows. im enal isaiye iyalvathu thalam....."
In the Aruvam form “God Siva” was represented as the “Infinite” - of no defined shape - known as “Omkaaram” in Tamil and “Pranavam” in Sanskrit. 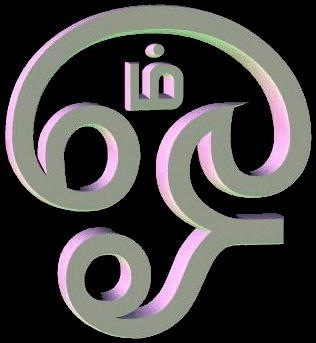 The Omkaaram form of "God as Siva" in Space (Andaveli in Tamil) emanates with the echoing sound "Om". From the 3rd Century to the 11th Century A.D. Tamil Nadu & Kerala brought forth 63 - Tamil Saiva Saints who were all known as the "Tamil Saiva Naayamaars" who realised God - as "God Siva" and were gifted with divine enligtenment and blessings, and lived a high spiritual life which lead them to be grouped as 63 - Tamil Saiva Saints of Tamil Nadu & Kerala. They were ardent devotees of God Siva and some performed miracles and some composed thevarems (religious hyms) entirely in Tamil in praise of God Siva and enligtening to all in Tamil Nadu and elsewhere the principles of "Tamil Saivaism" (Bakthi Movement). However all 63 - Naayamaars didnot compose thevarems or perform miracles, but lead ardent spiritual life and realised "God as Siva". "God Realisation" - is an "enlightenment" in our mind - with the divine disclosure of 'superior knowledge and intuitive power' to realise the truth of the 'eternal' worldly life, attained by the grace of “God Supreme” on our worship of him in 'intense meditation' with much piety. From this enlightenment emanates our divine - love, compassion, and understanding, towards the fellow human beings and other living beings, beyond the barrier of ego, anger, revenge, and self interest. The "Sages" (Munivar) in continuous 'intense meditation' fall within this grouping. Historically the details of the Tamil Saiva Saints were made known by the Tamil Saiva Saint Suntharamoorththy Nayanaar in his Pathikam the "Thiruththondar Thokai" which are listed below. Following the Tamil Saiva Saint Suntharamoorththy Nayanaar's "Thiruththondar Thokai" Pathikam in the 7th Thirumurai, we further come to know of all these Tamil Saiva Saints from the "Thiruththondar Anthathi" in the 11th Thirumurai of Nambiyaandaar Nambi of Tamil Nadu which too are listed below. 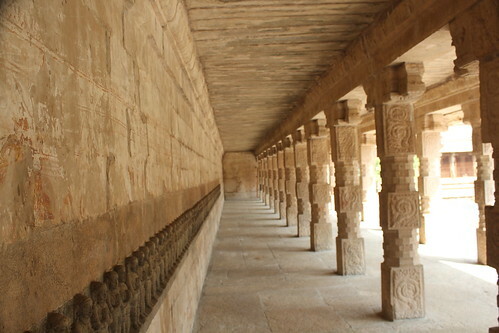 https://farm9.staticflickr.com/8207/...16de41c264.jpg The 63 - Tamil Saiva Saints along the long open corridor of Rajarajeswaram Temple (Ayravatheswara Temple) at Kumbakonam built by Rajaraja Chola - 2 : Courtesy - Thiru S.Sowrirajan of Fliker Website.